Beautify your outdoor living spaces with Pavestone’s elegant collection of pavers, retaining walls, patio stones and edging. 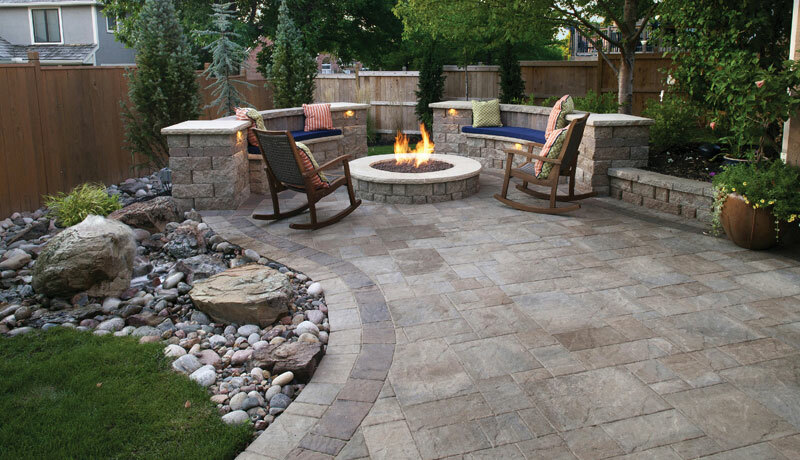 Our stone and concrete brick paving products transform landscapes into beautiful dreamscape. 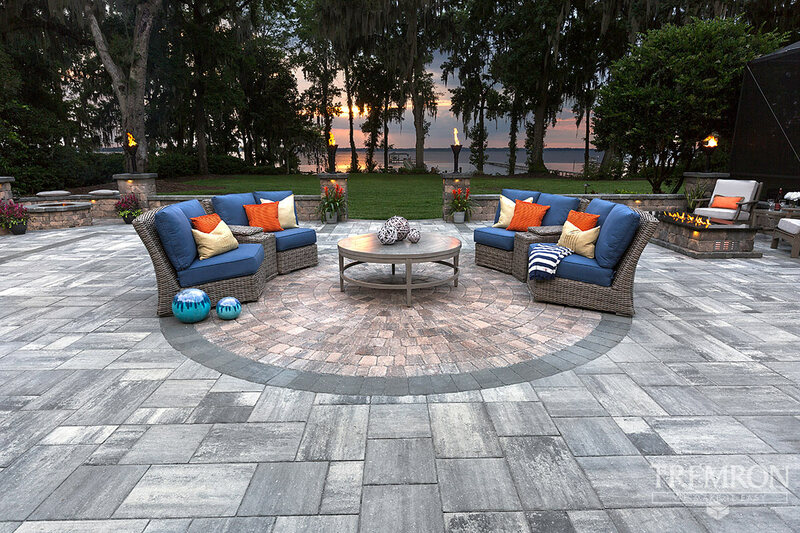 The Panorama™ series features rectilinear shapes, riven surfaces, and rounded edges which recall the timeless appeal of weathered cut flagstone. Designed for repeating random runner and ashlar patterns, Panorama™ Demi and Supra combos install quickly – they can even be combined to make a 6-piece pavement – and creates the aesthetic of historical Old World pavements. Panorama™ is available in a range of sizes and heights to suit overlay, vehicular, and large-format applications. The Venetian Stone™ product advent is the latest development in enhanced concrete pavers. Its uniquely attractive cleft surface sets it apart from other pavement treatments. The texture of this paver combo resembles old world charm and invokes a traditional convention. The larger scale of the Venetian Stone™ paver lends itself to stately residential settings and more expansive commercial applications. Its modular pattern equalizes the scale of any paver project and is fitting to most any architectural element. This product can be combined with the 6”x 12” Venetian Stone™ Rectangle Paver (269), the 12”x 12” Venetian Stone™ Giant Paver (270), the 6”x 9” Venetian Stone™ Rectangle Paver (255), and the 6”x 6” Venetian Stone™ Square Paver. Plaza Stone is a timeless paver with an impressionistic embossed surface profile. It creates a gentle and warm effect by combining the soft curved edges of the rectangular and square stones. Plaza Stone is available in many colors and in standard or Heritage™ Series (tumbled) finish to accommodate the most discriminating tastes and desires. Plaza Stone pavers use large-scale patterns to create interest and drama to commercial landscaping, while the stone’s texture and pattern harmonize with surrounding buildings and site furnishings. The 45mm paver is intended for non-vehicular traffic only. Bring a timeless touch to your outdoor decor with Olde Towne Antiqued pavers. The classic choice for hardscape projects where the smaller format of rustic European elegance is more appealing. 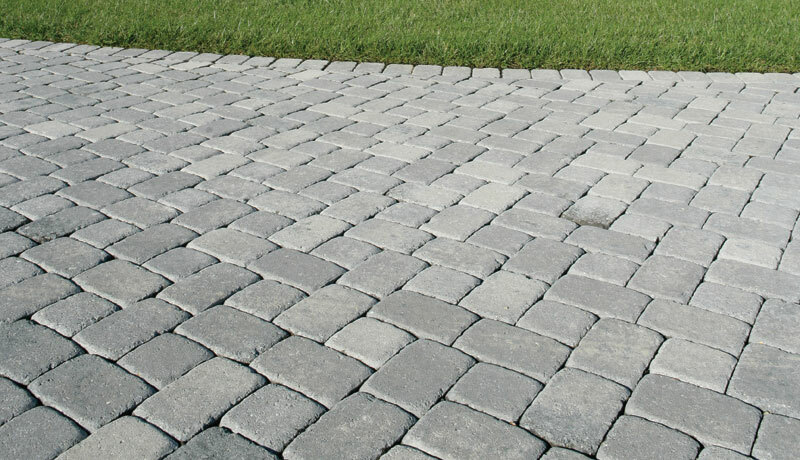 Offered in smaller sizes that are ideal for traditional or random patterns, while the naturally worn cobblestone appearance gives long-lasting beauty and old-world charm to any hardscape project. Mega Olde Towne Pavers has classic European look on a larger scale. 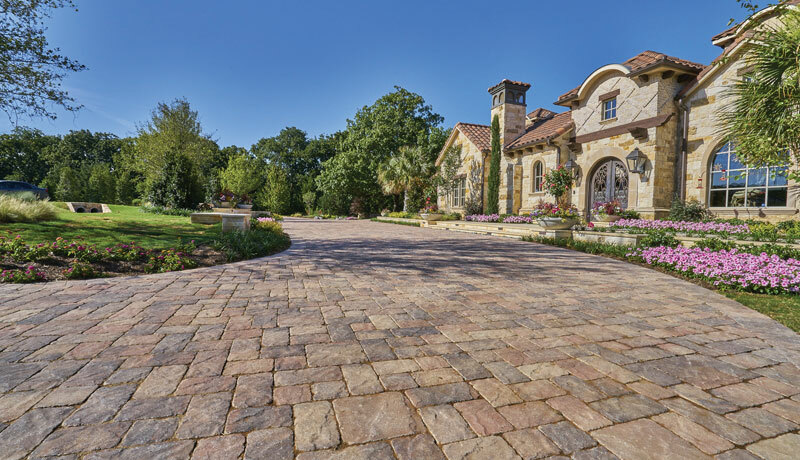 Mega Olde Towne pavers are the perfect choice for large projects or when your design demands a dramatic paving style.